Wind-horse flags on way to the Qomolangma.Photo by He Yunxiao. 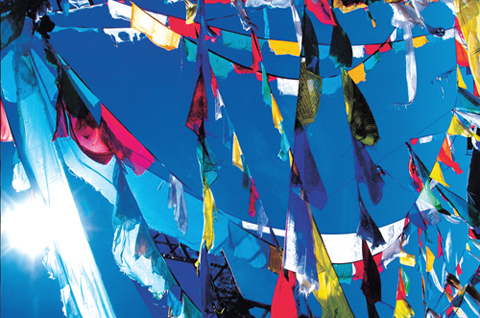 In Tibet, colorful sutra streamers catch the eye everywhere. They join snow-capped peaks, grassland, wilderness and glistening monasteries to form a unique sight in Tibetan-inhabited areas. Tibetans believe that, in Tibet, the eudemons of the lofty and precipitous peaks, rivers and wilderness overgrown with grass, are the gods of heaven and earth, who often patrol the snowy mountains, forests, grasslands and gorges riding on a wind-horse to insure that peace prevails and to block the intrusion of demons and evil spirits. This consciousness is expressed by sutra streamers, on which a walking horse carrying what the Tibetans call “Norbumeba,”symbolizing the flourishing of happiness, a good life and wealth, or an incantation, sutra lines or the image of supplication are printed. 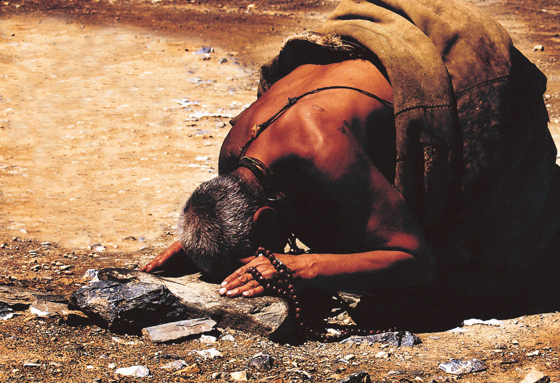 There is another story: a traveling Tibetan monk obtained the true scripture of Tibetan Buddhism. On his way back home, the scripture books got wet as he crossed a river. He spread the books in the sun to dry while he meditated sitting cross-legged under a big tree. Suddenly, the sound of religious gongs and horns echoed through heaven and earth, ripples of pattering resounded, a gentle breeze kissed his face, and the heaven and earth hovered over him. The monk suddenly felt thoroughly enlightened. He slightly opened his eyes to find that the wind had blown the scripture books all over the sky, earth and waters. From that time, people printed the scriptures on cloth and hung them between heaven and earth. Therefore a wind-horse flag became an important form of embodying folk-custom culture of the Tibetans, and was also a cultural symbol after the fusion of the ancient Tibetan Bon religion and Tibetan Buddhism. 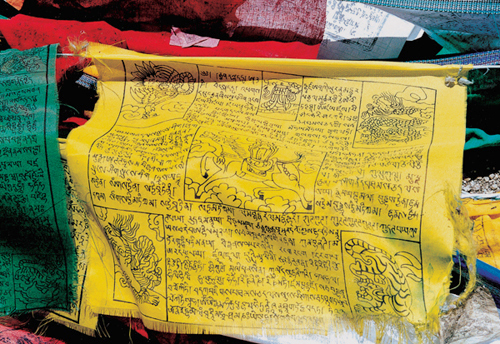 In general, a wind-horse flag is a piece of square and monochromatic cloth on which the pictures, such as the figure of Buddha, the Bodhisattva, those who protect Buddhist doctrine, a holy horse carrying sutras, treasure dagobas, Mandala, sutra lines, Six-Syllable Prayer and charms, are printed. The wind-horse flag with “holy horse carrying sutras” is the most popular. The treasure horse, beautifully decorated with pearls and jade, carries on its back the sutras symbolizing wealth and good luck. This horse is the mount of various gods from ancient Indian myths. A fierce tiger, snow lion, supernatural roc and auspicious dragon respectively decorate the four corners of the flag. Lines from the Six-Syllable Prayer or Bon religious spells are placed among them. This picture is printed on a piece of white, yellow, red, blue or green cloth respectively. Then many sets, or rows of them, are hung from tree branches or attached to cords. The early explanation is that white stands for the chaste heart of man, yellow stands for the mother earth, red stands for flame, blue for the sky and green for the rivers. The five colors have connections with the five elements, too. The explanation is that green refers to wood, blue to water, red to fire, yellow to earth and white to iron (namely, metal). When the peasant family changes the sutra streamers during the New Year, those, which are five pieces of monochromatic cloth without printing pictures, are only hung, from the top down, on a tree branch with many ramifications. At the centre of the sutra streamers is a fine horse wishing for auspicious in all things. As to the four-beast picture drawn on the four corners of sutra streams, the tiger inhabits the forest, and its image stands for wood or wind; the lion dwells in the mountain, and its image stands for earth; the roc flies in the sky, and its both horns spew flame, and this image stands for fire; the dragon resides in the sea, and its image stands for water. Wind-horse patterns. Photo by Degyi. The six natural sceneries of forest, mountain, earth, sky, rivers and sea are not directly drawn on the sutra streamers, but the images of animals living in these environments are regarded as symbols. It is obvious that it does not simply display the six natural sceneries, but looks on them as the main subject. The painted pattern on the horse’s back symbolizes that which helps people realize their wishes. With the exception of the five different symbols, generally there is a chief streamer bigger than the five different monochromatic sutra streamers. The color of chief streamer matches that of the selvage (hem), and is based on the theory of the inter-relationship between the five elements in the Tibetan calendar and fortune telling. If the chief streamer is green, its selvage should be blue. Wood relates with water among the five elements. Therefore sutra streamers bearing the drawing of horse symbolize the origin of life. According to the usage, wind-horse flags are divided into three categories. The first category is the “wind-horse flag” printed on cloth. A red or black pattern is pieced together and sutra lines are printed on many pieces of monochromatic square, triangle or foursquare cloth. The big flag is about two-thirds of a meter long and the small one less than one-third the length. It is used for the purposes of hanging or sticking. One group is formed every five colors. According to the environment and topography, they can be long or short: the long ones can reach over 100 meters; the short ones are alive and bright as small colored flags. They are stuck on the rooftop of grassland tents and houses. Every year, the sutra streamers stuck on the rooftop of every Tibetan house must be changed. The date of changing cannot be chosen at random. Some auspicious day after the first day of the New Year on the Tibetan calendar is chosen in light of the Tibetan Calendar. On this morning, when the sun has just risen and is shining on the rooftops, all of the families in their most festive costumes get together there for the grand and joyful ceremony of changing the sutra streamers, sacrificing to the god and praying for a blessing. Tibet Buddhist worshippers. Photo by Lu Ming. 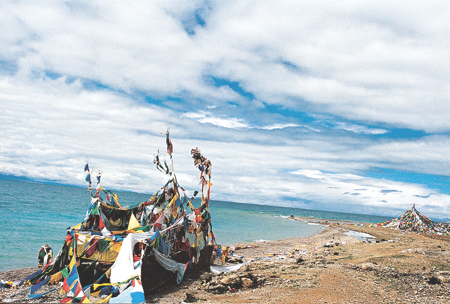 On the Tibetan Plateau, wherever there is some place for people to go, one will find wind-horse flags and sutra streamers. Whether it is on a joyful birthday or on New Year's Day or other festivals, multicolored wind-horse flags are hung to indicate that heaven, earth, human beings and animals are living in harmony. When the herds, looking for the water and grass, move into a new place, the first thing is to attach or hang sutra streamers after putting up the tents in order to pray for recognition and protection of the surrounds. When pilgrims in company with each other trudge across the desert, they must also lift a striking wind-horse flag or sutra streamer with their hands to pray for heavenly protection from losing their way or suffering some baneful influence. People hang the colored sutra streams all over the jungle and marshy land to imply homage and sacrifice to the tree god and water monster. Streamers are hung high in the wilderness and mountain to indicate the reverence and prayers to the mountain god and rock deity. They are hung in famous historical sites and old temples to show the veneration and adoration for Buddha and the various saints. When plowing and planting in spring, wind-horse flags are hung or stuck on the head and horns of the farm cattle to salute and pray to the land deities for a good harvest. Wind-horse flags by the Nam Co lake. Photo by Degyi. 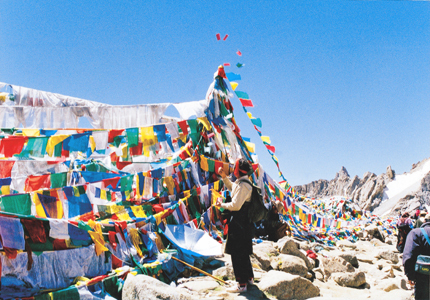 One can never forget the sight of wind-horse flags and sutra streamers layer upon layer, stretching several hundred meters between the Potala Palace and the Yaowangshan Mountain. This view can be seen all over the Tibet, and neighboring provinces and autonomous regions. In particular, in the woods along both banks of the Jinshajiang River wind-horse flags and sutra streamers are simply everywhere in the mountains and plains, almost blotting out the sky and hiding the earth. The second category is the wind-horse flag printed on paper. It can mainly be used in sacrificing to the sky god, mountain god, to laud the deity and dragon god, or during Buddhist prayer activities. It can also be hung or put up inside or outside the room as an oblation. The big one is one-third of a meter long and the small just a few centimeters long. The most usual type is one that displays a picture of the wind-horse flag printed on a piece of 5cm X 5cm paper. Thousands upon thousands of pieces of wind-horse flag paper are issued and used as a sacrificial offering. The third category is all kinds of sutra streamers. Generally it can be divided into two types according to color. The one category is where people print sutra lines and pictures in black or vermilion on a piece of white cloth. The other is the same as “wind-horse flags”, namely, people print alternately sutra lines and pictures on the blue, white, yellow, red or green cloth. In general it is also divided into four categories according to the difference in place and scene, belief and rituals or prayer function. The first category is the suspended sutra streamer hung according to circumstance, topography and usage, long or short, sparse or dense. The long ones are over several hundred meters long. Some are combined into a large dimension city of sutra streamers covering hundreds of square meters. The ideographic shapes of the suspended sutra streamers are various. The square pattern of wind-horse flags are printed on strip-shaped cloth. The second category is the stuck sutra streamer, where the patterns of wind-horse flags are printed on a piece of quadrate gauze or silk scarf, one side of which is stitched onto the flagpole, the other side is decorated with a large number of straight streamers. These wind-horse flags and sutra streamers are stuck at the entrance to a village or crossroads, or on the rooftop, mountaintop or mountain road. The third category is the sutra streamer dagoba. Sutra streamers dagobas are made of cloth of various colors, and also made into scarves like hada. In Kangding, Daofu and other counties, every village has one big umbrella-like sutra streamers dagoba, ring upon ring hung with silk wind-horse flags and sutra streamers, and used as a ground for collective sacrifice. In Madog County, among the headwaters of the Yellow River, a sutra streamers dagoba, over 10 meters high and more than 100 meters in circumference, is made of tens of layers of sutra streamers, connected in a radial pattern by many yak ropes around a tall sutra streamers pillar on the Mani mound at the center. The whole presents a model of broad gilded dagobas and is a magnificent sight. Tibetans spreading wind-horse flags over the Chomla Mountain of Kangrenboqe. Photo by Degyi. The fourth category is the pillared sutra streamer, which are often seen in the monasteries, temples of Buddha, sutra dagobas or house or on the mountaintop, gods’ mountain, or near a holy lake. A huge one is tens of meters long, such as the sutra streamers pillar at the foot of Kangrenboqe Mountain in Ngari, sutra streamers pillars in front of “100,000-auspicious-gate dagoba” of the Palkor Monastery in Gyangze, and so on. The top of the pillar is decorated with a gilded bronze sun and moon, treasure bottle, colorful umbrellas, the tail of yak, and the strip-shaped wind-horse flags and sutra streamers, tens of meters long, which swoosh in the wind.